It's my last morning on Hayman before one of its two luxury cruisers ferries me back to the Great Barrier Reef Airport, an hour away on Hamilton Island, where I'm to check-in for my flight home. Sharing my beachside lounge is a young couple, with arms and legs entwined and lips locked (when they are not whispering sweet nothings in French). She's as lithe and tanned as a swimwear model; he, with his lean, preppy good looks, could have just stepped off a Polo Ralph Lauren fashion shoot and I... well, I could be on the moon for all they seem to care. But as we count down the minutes till our transport to the marina arrives the couple's love bubble is suddenly burst. ''Excuse me for asking, but are you on your honeymoon?" a roaming staff member asks. "Non," they politely answer together." It's just a leetle 'oliday." "May I take your picture for our Facebook page?" They look at each other, smile and shrug before answering in the affirmative and striking a perfected pose. This scene resonates with all that this luxury Whitsunday island has become renowned for since the first tourists arrived at what was the Royal Hayman Hotel, established by Australian aviation pioneer Reg Ansett, in the 1950s. Seaplanes dropped off castaway couples back then. Expanded and renovated over the years that followed, Hayman became firmly established as the Whitsundays' 'diamond in the rough' by the mid-1980s. It has continued to attract a steady stream of high profile guests from rock stars, movie stars to business leaders, prime ministers and presidents including Tony Blair and Bill Clinton. 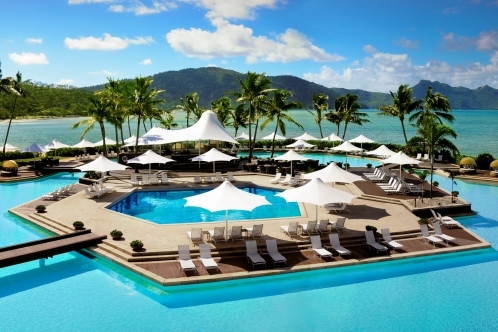 Today, Australia's most awarded five-star resort remains island of choice for luxury lovers (despite some serious competition from Hamilton's qualia) thanks to further recent enhancements under current owners Mulpha Australia Ltd (whose other hotel investments include Sanctuary Cove Queensland, InterContinental Sydney and Bimbadgen Estate in the NSW's Hunter Valley). However the time are a-changing.Malaysian-owned investment vehicle Mulpha Australia Ltd is has brokered a deal to have Hayman island managed by billionaire South African hotelier Sol Kerzner..Kerzner, the owner of luxury hotel chain One&Only and the Atlantis resort on the Palm in Dubai, will close the existing property on Hayman Island for around three months from January next year to complete yet further renovations. Surrounded by the Coral Sea in the most northerly of the Cumberland Group of Whitsunday's 74 islands, today your transport options also include a scenic helicopter ride or a smooth, champagne-fuelled experience by luxury launch. Accommodation options in this luxury resort also exude the all-important wow factor. The ultimate in romantic adult-only retreats are the new Kerry Hill-designed private beachside villas which come with butler service, complimentary refreshment bars, Apple iPads, Apple TV, interior plunge pools and open plan bathrooms (floor to ceiling windows ensure you're never without a view - even from the loo - although privacy screens are optional). Adjacent to the eight beach villas, and secured by the same gated access but concealed by lush gardens are 16 Retreat villas. Featuring king beds and outdoor rain showers (two rooms interconnect) - these have become a convenient option for parents who want their older children living close enough but far enough away from their child-free zone. All the villas lie closest to the sands which fan the postcard views on the south-eastern side of the island, looking out to forested Hook Island and Langford Reef. Hayman's Beach House (with direct beach access and infinity pool) and its Penthouses afford similar views and butler service. Fashion designer Diane Von Furstenberg was recently invited to add her signature style (and love of bold prints) to one of the two-bedroom penthouses, which are on the resort's eastern end. Overlooking the same lily-laced lagoon as the DVF Penthouse - my one-bedroom ground floor suite is more subtly decked out with new linens, custom furnishings, timber floors, marble bathroom and private balcony. While minus a butler and celebrity-brand rugs - it's hardly second rate. Due to their proximity to Hayman's expansive (multi-bridge spanned) swimming pool, the rooms and suites on the western end of the resort are a big hit with visiting families. Built over three inclining tiers and nautically themed, they vary in price, depending on size, position and features (such as King or Queen beds and separate living areas). All come with marble bathrooms and private terraces- some have direct pool access and some interconnect for added convenience. For those who decide once they arrive, they never want to leave - Hayman's exclusive and expanding clutch of private residences on the eastern hillside of the island (and those planned with the new marina on the 'sunset' side) now provide a rare opportunity to purchase your own slice of 'paradise'. And while the island has built its reputation on couples and honeymooners, facilities and services for children on the island continue to swell, to cater for the rising numbers of guests returning with offspring in tow. Children armed with torches are invited on walks to spot the island's family of rock wallabies which come out at dusk to graze. They can also enjoy guided butterfly walks through the 16ha of tropical gardens - totally replanted and redesigned in 2011 (post cyclones Yasi and Anthony) by celebrity horticulturalist and landscaper Jamie Durie. Also popular is fish feeding off the marina jetty or whale spotting between June and September. But without a doubt, the biggest reason families come to this region is to see the Great Barrier Reef - and Hayman's lucky guests enjoy a front-row seat. The undersea wonders are in fact just a few steps away; you don't even need to get wet. All is revealed when the sandy flats in front of the resort become exposed at low tide. The resort also has its own semi- submersible. Specialised activities like photography, cooking, fishing and snorkelling lessons, PADI Bubblemaker dive courses and tennis clinics by professional tennis management group PBI, are offered as part of the Hayman Kids Club Ranger program, available on weekends and during school holidays for children from five to 12 years. Families can enjoy a range of outdoor court games and activities together. As well as three all- weather artificial grass courts and one championship Plexi-cushion court, which can be lit up at night, the centre also features a combined basketball and netball court, squash court, gym, putting green and chipping range. This facility is also the starting point for walking trails to the island's hilltop lookout, secluded beaches and coves. Teens can also learn the secrets of good grooming with facials, manicures and pedicures available for them in the Hayman Spa which features 13 treatment rooms (including a couples room and Vichy room) sauna, hydrotherapy area and beauty salon. Hayman's new 'contemporary' attitude has also made its way to the resort's bars and restaurants. In particular Hayman's signature fine-dining restaurant La Fontaine has undergone a total transformation. The Louis XIV period furnishings have been replaced with a more contemporary formal design. Gone are the heavy drapes; bi fold doors now open out towards the pond (home to two swans), tropical gardens and private dining platforms. The centrepiece fountain, from which the restaurant gets its name, remains. Older fans will note however, that the 'feminine definitive article' in the name has been given the chop. The changes reflect Fontaine's new lighter, contemporary Australian menu (much more suited to the tropics) designed by executive chef Glenn Bacon. Hayman spoils its guests with a range of restaurant options. Besides Fontaine, you can dine on flavours from the East amongst exotic gardens at Oriental or check tablecloths at Hayman's alfresco Italian bistro, La Trattoria. Facing the sands and views, Azure is a great way to start the day with an a la carte or (more casual) buffet breakfast. Keep lunch light and enjoy it by the much photographed lagoon pool or (my personal preference) have Hayman's chefs whip up a healthy gourmet picnic to enjoy on an air adventure to the platinum sands of Australia's most famous beach - Whitehaven - or on a quick visit to local gem, Blue Pearl Bay. Just a 10-minute boat ride away, this small rocky, coral beach leads to some of the best off-shore snorkelling/diving in the Whitsundays. At Hayman, even the fish know how to get the paparazzo's attention! Ultimate Luxury: Bliss out with butler service and bountiful views from one of Hayman's Beach Villas. Most Indulgent Moment: A romantic, silver-service dinner for two on one of the private platforms overlooking Fontaine pond; a tour of Hayman's own Chocolate Room. Insider Secrets: Hayman's kitchen is the second largest in south hemisphere after Crown Casino in Melbourne. The pool is seven times the size of an Olympic pool. La Fontaine's chandeliers now take pride of place in the kitchen where weekly Chef's Table dinners are held. The Little Things: The champagne meet and greet. Hayman offers a great range of 'Learn to' experiences for adults and children (from diving to cooking and photography). Junior Luxies: Hayman's Kids Club (adjacent to the island school) offers day care, pre-school curriculum and range of supervised activities daily for children from six weeks up to 12 years for an additional charge. Children aged 5-12 years can also participate in the Ranger program offered on weekends and during school holidays. Second room discounts also apply for families. Dent in the platinum: Prices year round (excluding the Festive season December 21 - January 5) range from A$590 per room per night for a pool room, up to A$1,990 for a Beach Villa, A$3,700 for the Beach House and A$8,000 for the Owners Penthouse.